For sale/trade! 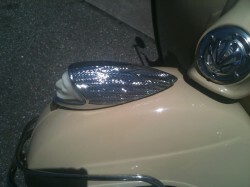 We just received 11 new-in-the-box chrome with white Indian face front fender lights. OEM: From the former Indian Motorcycle works in Gilroy, lot purchased when the factory closed. Complete, without base gasket. 12 volt. Ha ha! 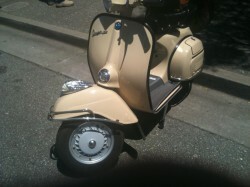 The perfect thing for a Vespa! This entry was posted in Motorcycle Museum: Up For Trade on 16 June 2013 by oldgeezer. Wow, forgot to check this for MONTHS! Yes, I still have them.